Nostalrius Begins - Quality wow vanilla realm (1.12) • View topic - [Addon] Questie *v2.66* - A quest helper for vanilla! Questie is a quest help addon for vanilla. It's currently under continuing development. - Cartographer has been removed in favor of astrolabe. This allows Questie to display objectives in all zones, not just the current one, and unifies the minimap. You can still use cartographer if you want to, though. - The tracker UI has been completely redone, but still not finished. You can now drag it from anywhere. Click a quest to show/hide the crazytaxi arrow. - Available quest logic has been overhauled, and is finally working properly. - All map/minimap "zombie" issues have been fixed with the move to Astrolabe. - A config system has been created, no UI for it yet but it can be done via slash commands. - Distance calculations now use astrolabe, which supports calculating distance across zone, and uses euclidean distance, which is much more accurate. - The tracker uses the "Automatic quest tracking" checkbox in interface options. If you have it checked, quests will automatically be added to the tracker when you complete an objective. If you uncheck it you need to manually add quests to the tracker. Last edited by Dyaxler on Wed Apr 06, 2016 3:58 am, edited 7 times in total. Re: [Addon] Questie *v2.3* - A quest helper for vanilla! Amazing! Sorry if this is a noob question, but is there a proper way to 'uninstall' the old questie so that there are no compatibility issues? Also, do we still need the !Questiecompatibility folder with this release? I just downloaded it and I can't move the quest tracker nor the arrow, how do I do it? Proxdox wrote: Amazing! Sorry if this is a noob question, but is there a proper way to 'uninstall' the old questie so that there are no compatibility issues? Also, do we still need the !Questiecompatibility folder with this release? You'd want to make sure all the old Questie folders are gone. You only need the one folder now. All of them have been collapsed into one folder for easier installation. Forgive me but i should have highlighted the changes in this version. * Added a SHIFT key modifier to the QuestTracker and QuestArrow - unless the shift key is down, you can't drag it. * Wardz's commit fixing/preventing the QuestTracker from being dragged off screen was also applied to the QuestArrow. * Added Bronze Feather to the Winfury Matriarch drop table for the quest Preparation for Ceremony reported by PierrickGT. * Added a small Worldmap modifier for those not running a Mapmod like Cartographer or MetaMap. This allows the user to see the chat output and allows the Popup dialog to appear so they can select a quest step to manually complete. * I discovered a typo in the code pertaining to EQL3. This fix now allows the user to track/untrack a quest from their QuestTracker with or without EQL3. FYI - MarkusNemesis just reported on GitHub that the quest levels that show up on the maps show up... well, a bit too early. 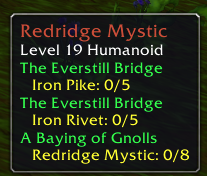 For example, some quests in Tanaris show up at level 30 where most players don't begin that zone until after they hit level 40. This is by design as this is how Blizzard intended quests to show up. I can't change the numbers in the database - way too many entries. I'm going to look into adding a user preference to filter the quests to not show up until you're within X number of levels. Thank you again MarkusNemesis for pointing something out that I had forgotten to look into. 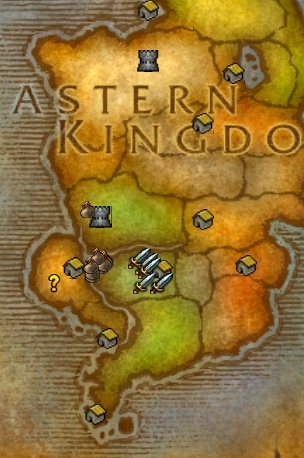 If you abandon a quest - it no longer appears on the world map. I'm going to look into fixing that so that it re-appears unless you manually force the quest completed. I f*cking admire your work and initiative, Dyaxler! Disable all and everything regarding the OLD Questie. Then you will not have this issue. 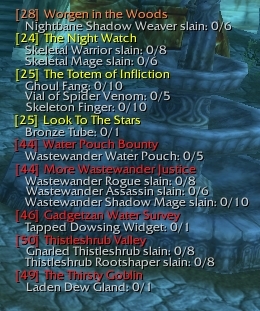 Quest tracker doesn't track Qs properly when I'm in an instance.